lets dump this 2 ratio dual motor stuff here then. Q. use 2 1/2 sized @ 1.51 for comparison? A. 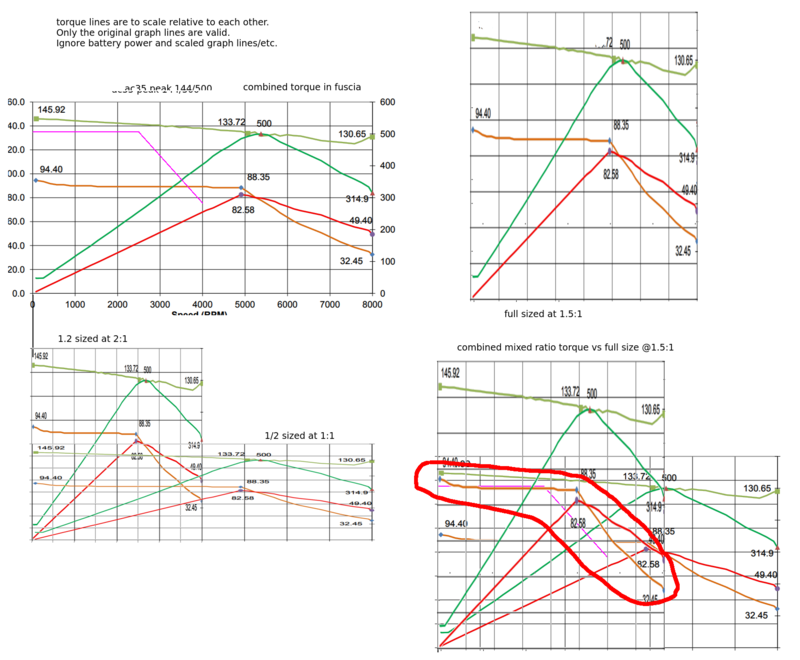 2 1/2 sized motors @ 1.5:1 vs full sized is irrelevant for this discussion (one is in reality better). If you want to do your own homework, you can complicate it as much as you like and clean it up as much as you want. Q. why did the fuscia torque line move from the full sized one? A. Because you changed something, but you don't seem to understand it. Were you expecting nothing to change with this proposal?!? Q. why does the fuscia torque line stop half way? A. because you didn't specify how to handle overspeed (and I'm not digging through your walls of text to look for one). Assuming you decouple the 2:1, congratulations, you have made a half-baked transmission, and the torque never catches up since it is running on just a 1/2 sized motor at that point, drops down immediately to the torque line on the 1/2 sized 1:1. Actually I lied, it "catches up" after the full sized 1.5:1 stops accelerating at 8k rpm. We aren't looking at continuous power here though, and depending on the speed, ratio, and cda/rr and the motors in question, it might not even accelerate to or past that point (do you understand that statement?). Q. what about my other questions? A. they were probably irrelevant, at least until you understand this much, or they were buried in walls of speculation that I didn't care to read thoroughly. Last edited by dcb; 30 March 2018 at 0725. Last edited by T Rush; 03 April 2018 at 0738. That's funny... I found it entertaining! Buy your batteries last. Actually, wait until your close to finishing your jackshaft set up. Because you never know what kind of battery deals you will find when you are ready for them. We are almost due for a leap in batt chemistry engineering which will make everything currently available obsolete. Lots of good deals are right around the corner. are the first gen Leaf modules sealed ?